As much as I used to dread settling down to school routine after a long summer break, going back to school has always remained fun. There was something special about new school bags, the fresh smell from the notebook covers and the funky labels on them, new pens, geometry boxes and what not. I guess I’ll never outgrow them! September is lunch box recipes @ mommyscuisine and I would be blogging in a handful of quick and easy to pack lunch recipes that are healthy too. 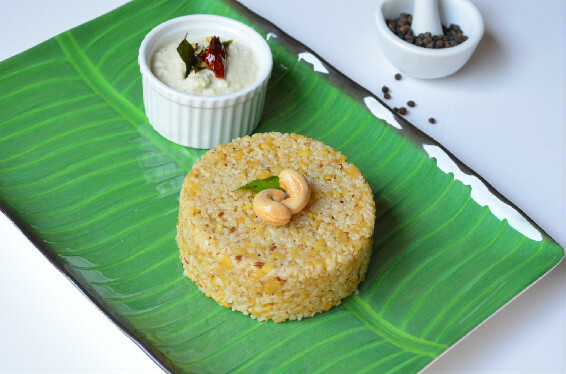 Today’s recipe is wheat rava pongal and here’s how we cook it ……………. Note: For recipes like upma, and pongal I always add salt then taste the water. If the water is salty then my dish would have the perfect amount of salt by the time it is cooked. In a pressure cooker, heat ghee and add cumin seeds, green chillies , ginger, and curry leaves . saute for a minute. Add moong dal, black pepper powder, hing(asofetida) and cashew nuts then fry for about 5 minutes on medium flame or until the moong dal turns light golden brown. By this time you can smell a nice aroma from the moong dal. Add wheat rava and saute for 2 minutes on medium flame. In a deep pan, heat ghee and add cumin seeds, green chillies , ginger, and curry leaves . saute for a minute. Add water, salt to taste gently mix. Bring the water to a boil then cover the pan with a tight lid, and cook until done (about 15 to 20 minutes). Hi Sis.. Gud Recipe we’ll try it…keep on posting….